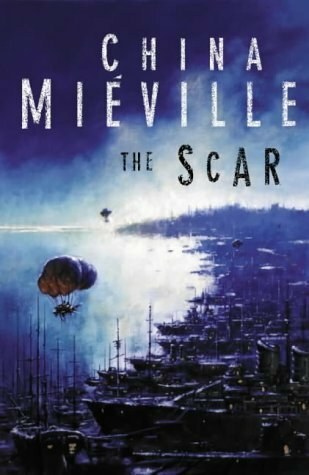 "The Scar begins with Miéville's frantic heroine, Bellis Coldwine, fleeing her beloved New Crobuzon in the peripheral wake of events relayed in Perdidio Street Station. But her voyage to the colony of Nova Esperium is cut short when she is shanghaied and stranded on Armada, a legendary floating pirate city. Bellis becomes the reader's unbelieving eyes as she reluctantly learns to live on the gargantuan flotilla of stolen ships populated by a rabble of pirates, mercenaries, and press-ganged refugees. Meanwhile, Armada and Bellis's future is skippered by the "Lovers," an enigmatic couple whose mirror-image scarring belies the twisted depth of their passion. To give up any more of Miéville’s masterful plot here would only ruin the voyage through dangerous straits, political uprisings, watery nightmares, mutinous revenge, monstrous power plays, and grand aspirations." I bought one of Mieville’s earlier books, Perdido Street Station, for two reasons: 1) The cover appealed to me, and 2) it was very thick. I was a poor uni student at the time you see, with a very limited book buying budget, so doorstoppers represented much better value. What can one say about Perdido Street Station? You’ll love it or you’ll hate or, more likely, you’ll love and hate it at exactly the same time. And what more can an author hope for than that? I found Perdido Street Station to be such an intense and overwhelming read that it put me off China Mevielle a little. Not in a bad way, it was more like when you eat a bar of super dark chocolate and have to go a few days before you can eat some more. Except just replace days with years, because that’s how long it took me to find the strength to return to Mieville’s world of Bas Lag. I was expecting the Scar to be as draining and awesome and frustrating as Perdido. Original settings wasted on a meandering plot, quirky characters getting a little lost amongst all the chaos, clear and sharp scenes book ended by lengthy blocks of confusing prose. But it seemed, to me at least, that the Scar displayed all that I loved about Perdido Street Station, and discarded all that I didn’t. Or, to put in another way: I loved every single thing about this book. Seriously. While devouring it I would often set it down, get up from my cosy reading nest in front of the fireplace, find my boyfriend and shout ‘how can this book just keep getting better?’ It’s like it defied some law of literary physics, the way the Scar would just keep ramping up the awesome. The cast is populated with good people doing bad things and bad people doing good things, and you fall in love with some of them despite the awful things they have done, and you feel desperately bad for some them again in spite of the awful things they have done at the end you realise that there is not one character in the book who is wholly without blame for the all the catastrophic bad stuff that goes down. And frankly, I wouldn’t have it any other way. There are plots and sub plots and sub sub plots and yet the book never feels crowded, and when the book ends there were no loose ends. Consider that for a moment. The Scar features a huge cast, with scads of POV characters, and every single one of them has their own story arc and at the conclusion of the book every one of those arcs has come to a satisfactory (which is not to say happy, no sir) conclusion. It all ends so perfectly that I don’t feel the slightest desire for a sequel. It all ended so perfectly that I actually find the idea of a sequel to be vaguely repulsive. I had almost exactly the same reaction. Perdido was a very interesting book, but not one I loved. The Scar, on the other hand, was absolutely perfect in every way. I couldn't put it down, and, when I had to, I couldn't stop thinking about it. Unfortunately, it's the only one of Mieville's novels to have done that. He's always very interesting, but I'm generally not as emotionally involved as I'd like. I just started this one after being blown away by Perdido Street Station!